Nestled in the foothills of New England's Berkshires, our coffee roastery hearkens back to an earlier America...a time and place where fine things were produced by village craftspeople who nurtured their products from start to finish. You will find that our hand roasted coffee beans, whether organic coffee, decaffeinated coffee, or our rich assortment of flavored coffees-- are as delicious as coffee can be. They sold their first beverage, an “Iced Island Delight,” on the ferry dock of Peaks Island, Maine, on July 4th, 1990. From there, they packed their growing collection of equipment (and daughter Annabelle, now our GM!) into a van & a trailer and set off to fairs & festivals up and down the east coast, bringing high quality coffee to places that’d never seen or tasted it before! From there, new locations started to cry out to house an SFCR shop---and so they were born in Northampton, Easthampton, Greenfield, Hadley, East Longmeadow, and most recently, an additional cafe located on Main Street in Northampton! Along the way, we started baking our own fresh, delicious pastries, and have continually added new goodies to the lineup. And we began making our fabulous signature blender drinks featuring fresh squeezed fruit juices---and sumptuous, savory breakfast & lunch sandwiches- Wonder what’s next...? 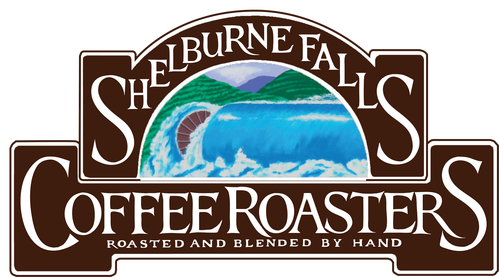 Shelburne Falls Coffee Roasters was born out of a love of coffee---of great tasting coffee in all its varieties & manifestations, and all the ways & places in which coffee is enjoyed.